It’s a known fact that a leveled Ram 2500 truck with larger tires looks much better than stock, but which is the best leveling kit for Ram 2500 trucks? These days you can level your Ram truck without giving up any of its payload or ride quality, and do so with normal hand tools in your driveway or garage. Better stance, fit bigger tires, no compromise on ride quality? What’s not to love? Rough Country 2.5-inch Lift Kit w/ Front & Rear Lifts & Shocks Includes shocks w/ front and rear lifts. 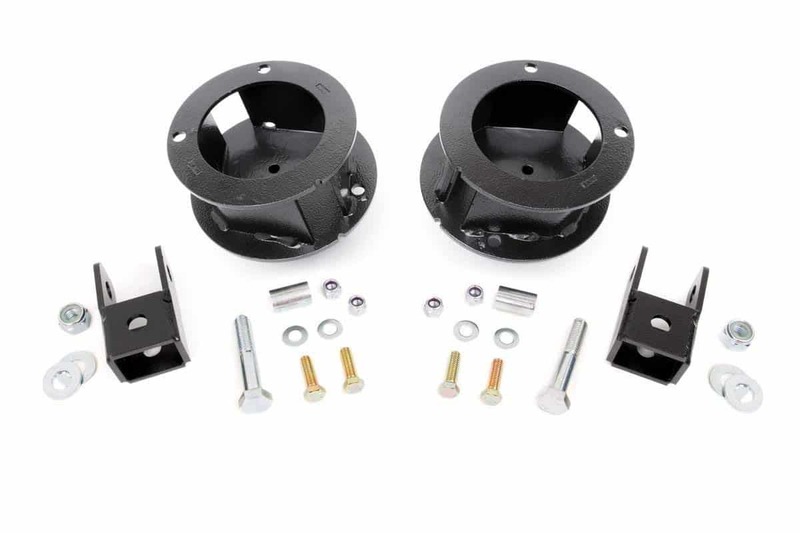 Rough Country 2.5-inch Leveling Kit Coil spring spacers w/ shock relocation brackets. 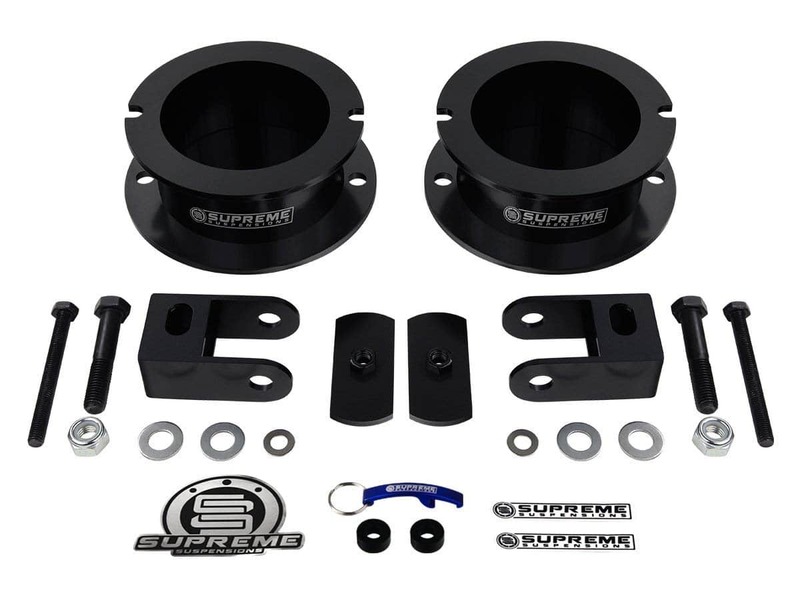 Supreme Suspensions 2.5" Leveling Kit High-strength carbon steel front spring spacers. 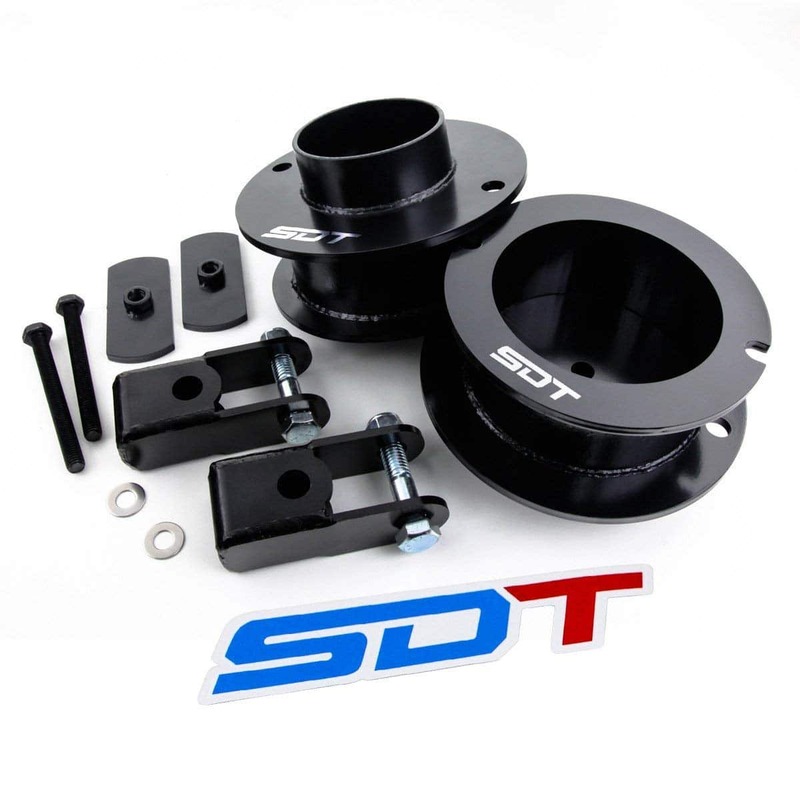 SDT 2.5" Leveling Kit Transferable Lifetime Warranty. Skyjacker R25 Coil Spring Leveling Kit 2-2.5 in. Coil Spring Leveling Kit. During the install process, you’ll note how easy it is to complete with such simple tools. Then, after your install, you’re going to realize just how nice your truck looks with the little bit of leveling while keeping that same, great factory ride quality. In fact, some report that they actually like how their truck rides better after they install these parts. The durability of the parts in this kit is unparalleled so you will get to love this purchase for many years to come. And, what’s even better, is the fact that they come with a lifetime replacement warranty. 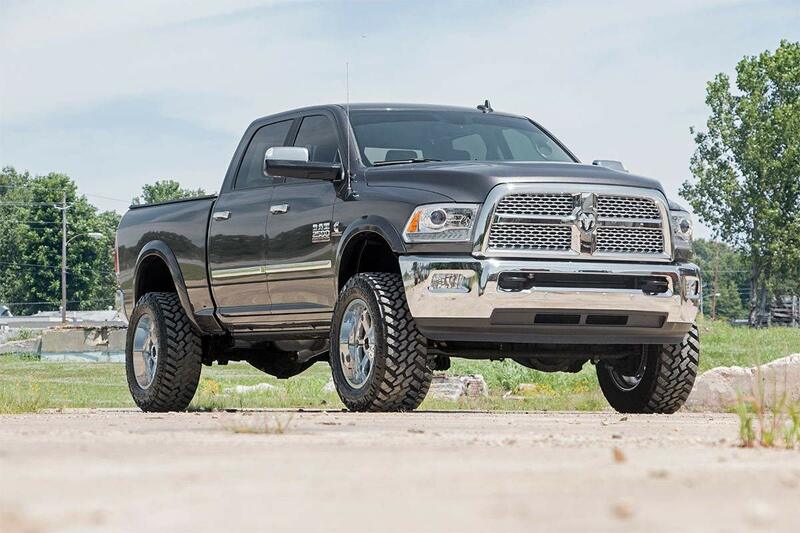 Therefore, you can have an improved truck for the rest of your life if you go with this best leveling kit for Ram 2500. Most leveling kits don’t come with shocks for all four corners, but this one does, which is one of the main reasons we’ve chosen it as the best leveling kit for Ram 2500. This kit will not disappoint. That’s right! It’s Rough Country again! If Rough Country is going to be awesome at putting out sweet leveling kits, then you bet that we are going to give them the credit that they deserve. In this kit, you are going to find a similar setup to the lift kit that we mentioned earlier but with a little bit less. Here, you will only see two coil spring spacers, two shock relocation brackets, and hardware to finish up your installation. This is because you will only be raising up your front end rather than altering both axle heights of your truck. With this setup, you will end up with that level look across your whole truck. But the thing that we love about this kit is that it comes with the same lifetime warranty that our other Rough Country kit has. This way, you will be able to get the same awesome duration out of your new favorite aftermarket piece. While you may know Supreme Suspensions for their – well – suspensions, their other suspension related products are absolutely worth taking a look at. Supreme Pro Signature decals and a bottle opener keychain. If that’s not cool, we don’t know what is. Your installation with this kit will take a quick two to three hours, much like many other leveling kit but what’s special about this product is the superior strength that comes from the carbon steel. You’re guaranteed that this substance is not going to deform and degrade with use so you can expect to use this product over the lifetime of your truck. If you want to be extreme, you have to have this Supreme Suspensions product. Who likes transferable lifetime warranties? Oh, and follow that up with a 100% customer satisfaction guarantee. We would think just about anyone. With this StreetDirtTrack leveling kit, you get just that: a guarantee that you will have a product that you like for life. Wow, we know. Providing a two and a half inch lift with as simple as an install that you would expect from a leveling kit, you’re about to have a leveling kit for life that gets your truck looking sturdier, sexier, and just overall better. With StreetDirtTrack, your order will be processed on the same day if you order before 3 PM PST (except for during those busy times). Overall, it’s clear that StreetDirtTrack is all about satisfying their customers with all of these awesome benefits so you would be smart to go with their leveling kit. Want to take a different approach to leveling your Ram 2500 truck? Well let’s get that sucker on even ground with these leveling springs from Skyjacker. This Skyjacker R25 leveling kit replaces your stock springs that will allow you to fit larger tires and give your truck a better stance. The new stance will breathe new life into your truck, giving it a head-turning sharpness. This kit uses longer springs to achieve the leveled look. According to reviewers, this product is listed as a two and a half inch lift but, in reality, you’re going to get more like a two inch lift. As long as you are prepared for that, you are going to love this kit and enjoy it for years to come. Leveling kits are one of the most popular upgrades that truck owners, namely those of Ram 2500s, will do, next to intakes, exhaust, headlights, tuners, and wheels/tires. They’re inexpensive, easy-ish to install, and allow you to run larger tires. Leveling kits are not the only option for getting a truck lifted up so we want to make sure you are informed about the type of product that you are buying. A leveling kit is probably the simplest way to get that easy lift and we’ll discuss how that is so in the following. Put your learning hat on, folks, and find out what leveling kits are all about. A leveling kit is actually a very simple piece of equipment that works just as simply. 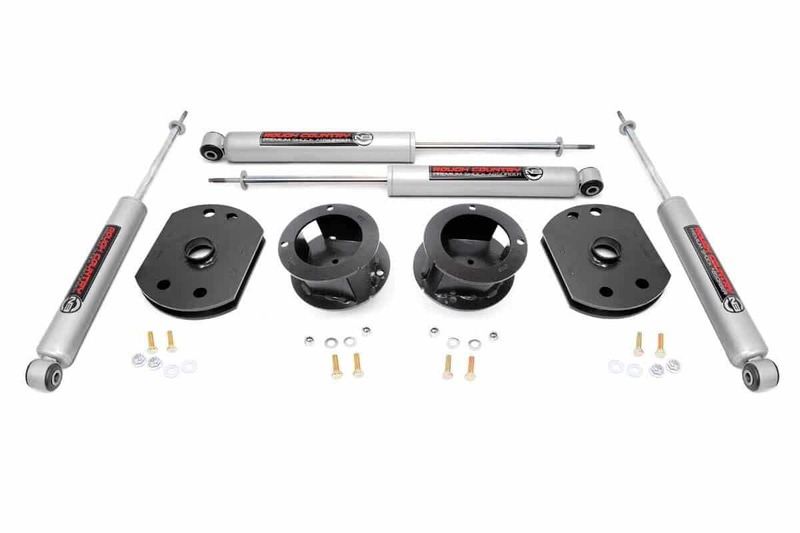 Your leveling kit will feature a series of spacers, shock relocation pieces, and other hardware that all work together to elevate the front end of your truck. The spacers are set to keep your suspension a little bit more opened up so that the body of the truck is higher without any further modifications. Once installed, the lifters will all work together so that you will have a more level experience in your truck, which usually allows for slightly larger tires. The advantages of a leveling kit are numerous. First off, installing a leveling kit is most often done simply for looks. Having your truck leveled off will just give you a polished and clean look to your ride. Second, you’ll be able to have your truck raised up without sacrificing any of your payload. Since you aren’t doing anything to your rear suspension, your payload will remain unchanged while you still get that leveled off look for your truck. Third, leveling usually allow for you to install larger tires. The leveled look, plus larger tires equals a much better stance. It is often said that leveling kits are also good for jacking up a truck without being ridiculous. So, if you want to get your truck a little higher without turning it into “that one truck down the street,” a leveling kit is a perfect way to do so. When getting a leveling kit, there are several things to look for. The first thing you absolutely have to pay attention to is the fact that the leveling kit needs to fit your truck. Every kit on this page is a top contender for the best leveling kit for Ram 2500 so you know it is going to work for your ride as long as you’ve got a Ram 2500. But be sure to double check that it fits your year. After that, you may want to consider exactly what height you do want your vehicle is at after install because not all of them will create a perfectly even vehicle body. All of these leveling kits will raise the front of your ride so that it is more even or perhaps with its nose in the air, but there are differences between each all the same. Good: Spacers: the most economical choice. 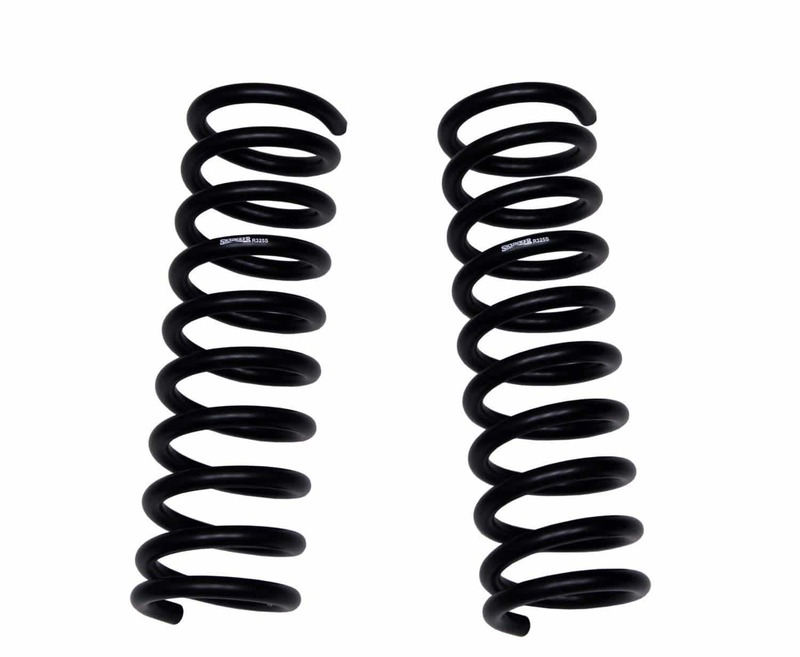 Better: Shocks w/ adjustable spring seat: a little more expensive, but better performance. Best: Springs / Coilovers: Most expensive, but the best performance. As far as what to avoid with a leveling kit, we can’t say much since they are such a simple product. he only serious item that you need to avoid when getting your leveling kit is making sure that you don’t make a purchase that doesn’t fit your truck. Lucky for you, all of the leveling kits on this list will fit your Ram 2500 because, well, they’re one of the best leveling kit for Ram 2500 options around. So, the simple nature of leveling kits don’t leave much that you need to avoid other than making sure you get a nice fit, however, a nice lifetime warranty does not hurt. How to install a leveling kit? Installing a leveling kit is one of the easier install processes that you will go through to improve your truck. All you must do is undo the bolts that hold your front arm assembly together so that you can undo your suspension spring. After that, you’ll place your spacers so that your springs have some extra – wait for it – space. The front end of your truck will now be higher. Each kit will have instructions that you’ll need to follow carefully. Will a leveling kit damage my truck? A leveling kit will not do any damage to your truck. You will retain the same great payload that a Ram 2500 can provide since you didn’t mess with your rear suspension and, as long as you did a proper install, nothing about your existing suspension will be in peril. Leveling kits are humble and harmless by nature. Will a leveling kit void the warranty? A leveling kit will not void any warranties that you have on your truck. Thanks to consumer protection laws, a manufacturer would have to be able to prove that your leveling kit was the source of the issue that occurred with your truck. As we have previously stated, though, leveling kits are harmless and won’t do any damage to your truck when installed properly. Therefore, nothing about your warranty will end up voided. Can you put a leveling kit on a 2WD? You can definitely put a leveling kit on a 2WD vehicle. The front drive train does not keep you from leveling it, however, there way be some differences in the 4wd vs 2wd kits. Please check to make sure they one you buy will fit. Will a leveling kit mess up alignment? We suggest you get your truck aligned after installing a leveling kit. The kit can mess with the alignment, so make that appointment. With all this talk about the best leveling kit for Ram 2500 trucks behind us, it’s surprising you haven’t gone and grabbed your own already! Installs are far easier than any other lifting option you’ll see and the parts themselves are less invasive than other lifting kits. For these reasons, producing that leveled look is super easy, relatively affordable, and extremely effective. We don’t blame you for wanting to level off your truck and getting a leveling kit is the easiest way to do it. Level with yourself at this point, man, because you have to go get one!